We present the fourth portion of a Galactic plane survey of methanol masers at 6668 MHz, spanning the longitude range 186°–330°. We report 207 maser detections, 89 new to the survey. This completes the southern sky part of the methanol multibeam survey and includes a large proportion of new sources, 43 per cent. 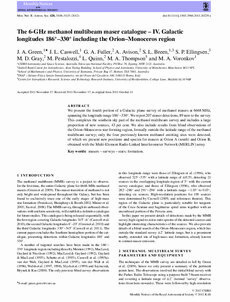 We also include results from blind observations of the Orion–Monoceros star-forming region, formally outside the latitude range of the methanol multibeam survey; only the four previously known methanol emitting sites were detected, of which we present new positions and spectra for masers at Orion A (south) and Orion B, obtained with the Multi-Element Radio Linked Interferometer Network (MERLIN) array.